When the runaway hit arrives home on Digital HD, Blu-ray™, Disney Movies Anywhere, DVD and On-Demand platforms this Tuesday, June 7, 2016, viewers will not only be able to enjoy the vibrant world of Zootopia and reunite with their favorite characters, but also discover more about the evolution of this extraordinary tale through in-depth bonus offerings. Bonus features include candid conversations with filmmakers and artists behind Zootopia, an alternate opening, never-before-seen characters and deleted scenes, and a sneak peek at some of the hidden Easter Eggs that make reference to Disney Animation’s most beloved films and characters. 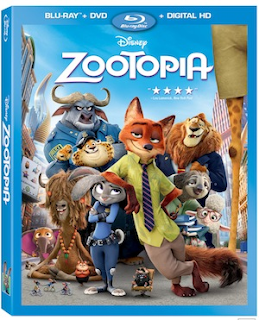 Purchase Zootopia (BD/DVD/Digital HD) [Blu-ray] on Amazon for $19.99 & FREE Shipping on orders over $49. All I knew going into Zootopia was it was about a mammal metropolis, where animals had common jobs like law enforcement, DMV workers, etc. It looked cute and my kids had been wanting to see it since it was at the theaters. I was pleasantly surprised at what an amazing film it actually was. Hubby and I were laughing along with the kids while we watched it! It does teach kids a valuable lesson... that they can be anything they want when they grow up. They don't have to follow their family footsteps! Judy Hopps aspires to be the first bunny cop, while her family all wants her to stick with the carrot business. She excels at the Police Academy, only to be relegated to parking duty. Then a random encounter with con artist Nick Wilde provides her a career-changing opportunity. A number of animals are turning up missing or turning back to their predator state and Judy wants to prove herself and solve the case. It was a great story line and I loved watching the characters develop and find themselves. This is a must have movie!